Gene Smith was born in 1935 in Marks, Mississippi, and grew up in Tunica, where he made Eagle Scout at the age of 13. He was commissioned through the Air Force ROTC program at Mississippi State University on July 13, 1956, and went on active duty beginning September 26, 1956. Smith completed Navigator Training in December 1957 and the Radar Intercept Officer Course in July 1958. 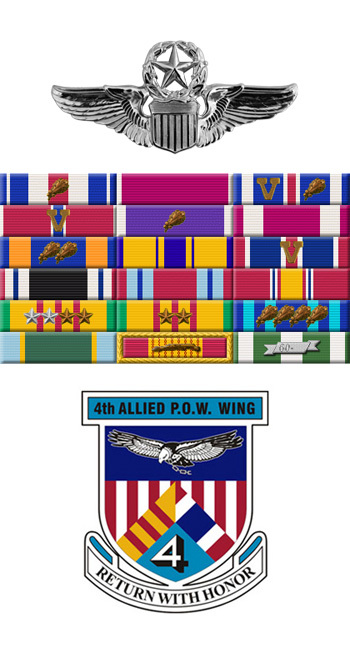 He then served as a Radar Intercept Officer on F-89 Scorpions and F-101B Voodoos with the 445th Fighter Interceptor Squadron (FIS) at Wurtsmith AFB, Michigan, from July 1958 to October 1961, followed by Undergraduate Pilot Training at Williams AFB, Arizona, where he was awarded his pilot wings in October 1962. After completing F-102 Delta Dagger Combat Crew Training, Capt Smith served with the 82nd FIS at Travis AFB, California, from June 1963 to January 1965, and then with the 496th FIS at Hahn AB, West Germany, from January 1965 to February 1967. He completed F-105 Thunderchief Combat Crew Training in July 1967, and then served with the 333rd Tactical Fighter Squadron at Takhli Royal Thai AFB, Thailand, from August 1967 until he was forced to eject while flying his 33rd combat mission over North Vietnam and was taken as a Prisoner of War on October 25, 1967. After spending 1,967 days in captivity, Maj Smith was released during Operation Homecoming on March 14, 1973. He was briefly hospitalized to recover from his injuries at March AFB, California, and then completed Pilot Instructor Training before serving as an instructor pilot with the 50th Flying Training Squadron at Columbus AFB, Mississippi, beginning in November 1973. Col Smith later served as Operations Officer and Commander of the 50th FTS, Assistant Director of Operations of the 14th Flying Training Wing, and finally as Director of Operations of the 14th FTW before retiring from the Air Force on July 31, 1978. After his retirement, Gene served as Executive Director of the Golden Triangle Regional Airport from 1979 to 1999, National President of the Air Force Association from September 1994 to September 1996, and National Chairman of the Board of the Air Force Association from September 1996 to September 1998. The Smith Ceremonial Plaza at Columbus AFB is named in his honor. His wife of 45 years, Rae, passed away on December 23, 2003, and he married his current wife, Lynn, in October 2004. Gene has three children from his first marriage-Kelly, Richard, and Stacy. 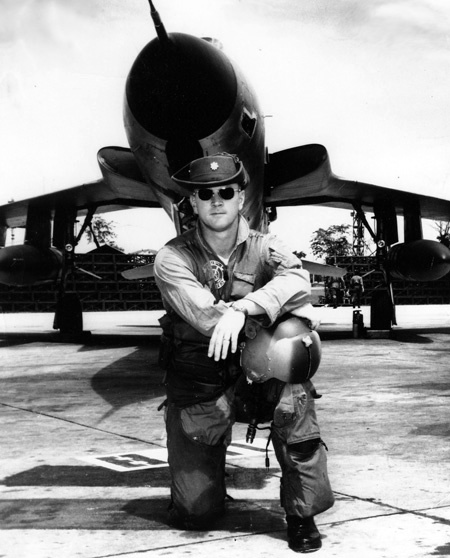 Major Richard E. Smith Jr distinguished himself by gallantry in connection with military operations against an opposing armed force as the pilot of a Republic F-105D Thunderchief over North Vietnam on 25 October 1967. 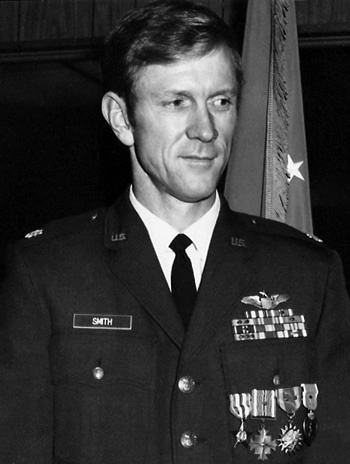 On that date, Major Smith led a flight which was part of a strike force directed to attack the largest and most important railroad and highway bridge in North Vietnam. He flew through a surface-to-air missile attack and extremely intense and accurate anti-aircraft artillery barrages to place his ordnance directly on the bridge. Major Smith's bombs dropped one span of the bridge into the river. By his gallantry and devotion to duty, Major Smith has reflected great credit upon himself and the United States Air Force.